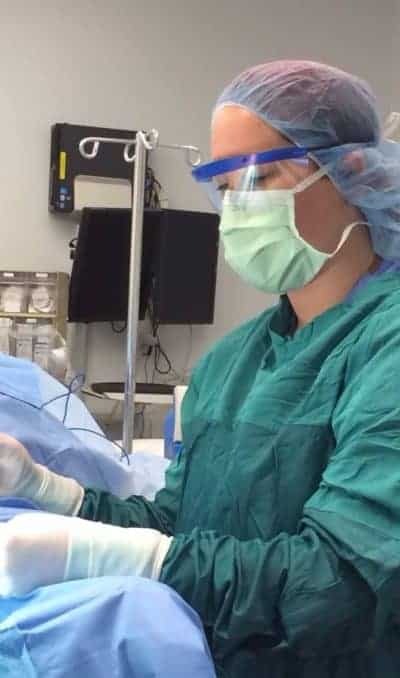 Dr. Alyssa Carroll in the operating room during her residency at Christiana Care Health System in Wilmington, DE. In the new era of medicine a multidisciplinary, or team, approach is not only becoming the new norm, but it is also becoming more and more important. By definition, we as specialists are experts in our field. In the case of the foot and ankle, we pride ourselves in the knowledge of our respective area; we also rely on others to complete the clinical picture for many of our patients. Let’s take a look at how multidisciplinary approach affects you, as the patient. A diabetic foot ulcer is like an iceberg floating in the ocean. The casual observer sees a small, benign piece of ice, while underneath lurks a sizable structure that will require many hands to study and effectively conquer it. All diabetics have related neurologic, metabolic, vascular and podiatric issues that benefit from a multidisciplinary team of specialist doctors. One patient may require as many as six to seven specialists to keep their disease controlled. The list includes, but is not limited to: primary care, endocrinology, podiatry, nutrition, neurology, infectious disease, vascular, and pedorthist. These fields must meld together in a team approach to give the patient the best care. In a hospital setting, a multidisciplinary network is usually built in, and consults between specialties is a relatively streamlined process. However, in the outpatient setting it certainly can be more difficult. With electronic medical records (EMR) and other technological advances, this should hopefully become more efficient. However, it is still extremely important for us as this patient’s podiatrist to call on our colleagues of different expertise to ensure the disease in question is tackled from all angles. Your podiatrist and other providers work diligently to build a good repertoire with clinical providers in your local community to develop a team atmosphere. We know the important role physical therapy and other ancillary healthcare providers play. Many of our podiatry patients benefit from their services, so we try and get to know these providers in the area. The more providers that we know, the greater the opportunity to work with other providers in tandem to give exceptional care to our patients. Dr. Alyssa Carroll practices casting on her colleague. 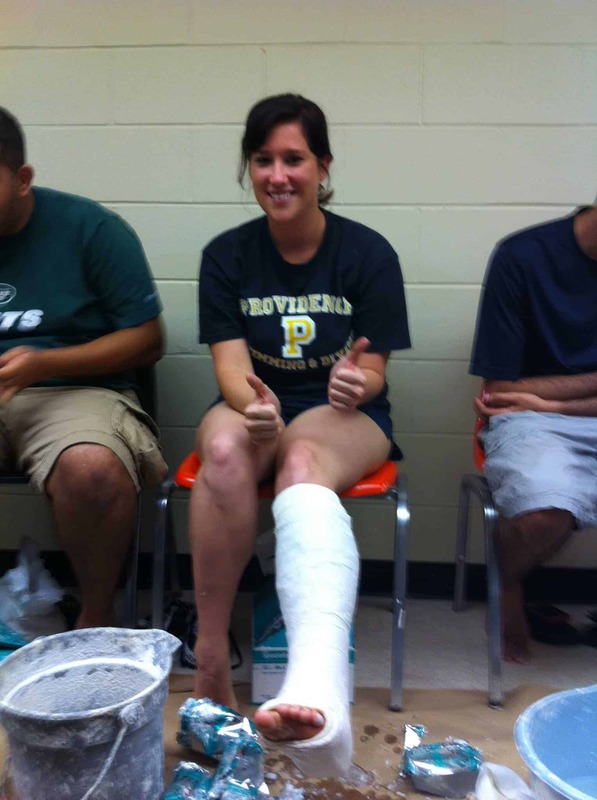 Dr. Alyssa Carroll assists her colleagues in casting. We stay engaged with these connections in order to benefit our patients and have more tools in the toolbox. The multidisciplinary approach affords a wealth of knowledge and resources for the patient. After all, as a podiatrist, there is no better feeling than being able to look assuredly at our patients and lay out a plan to get you well. 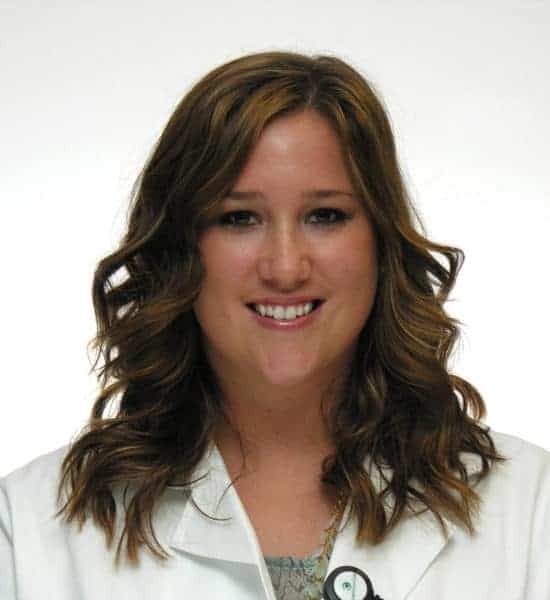 Dr. Alyssa Carroll is the newest doctor of the Foot and Ankle Specialists of the Mid-Atlantic and works in the Raleigh, NC (Millbrook) office. Dr. Alyssa Carroll and Foot & Ankle Specialists of the Mid-Atlantic, LLC expressly disclaims all warranties of any kind, whether express or implied, related to any products offered for sale on this web site. Dr. Alyssa Carroll and Foot & Ankle Specialists of the Mid-Atlantic, LLC further expressly disclaims any product warranties of effectiveness or fitness for any particular purpose or use. You are solely responsible for your use of, or reliance on, any products offered for sale herein, and any consequences arising out of such use or reliance. In no event will Dr. Alyssa Carroll and Foot & Ankle Specialists of the Mid-Atlantic, LLC be liable for any damages resulting from use of or reliance on any such products, whether based on warranty, contract, tort or any other legal theory.